Baked Hawaiian chicken is an easy main dish that only requires 10 minutes of preparation. The cooked chicken is tender and juicy leaving you with even more delicious leftovers! There are many Hawaiian chicken recipes online but this is my favorite one. I choose to use skin-on, bone-in thighs so that the sauce and the chicken will be extra flavorful and you also get the crispy chicken skin (a real delight!). My recipe does not call for marinating the chicken. 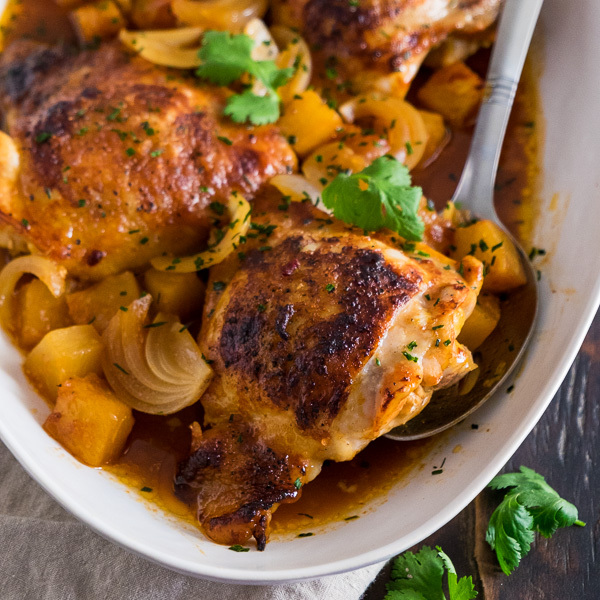 All you need to do is mix the sauce in a baking dish, place the chicken and pineapple into the sauce and let it bake for 35 minutes. The result will be a super flavorful sweet and sour sauce with tender, juicy chicken with a crispy skin. If you want to prepare the dish ahead of time and serve it later, that is even better. 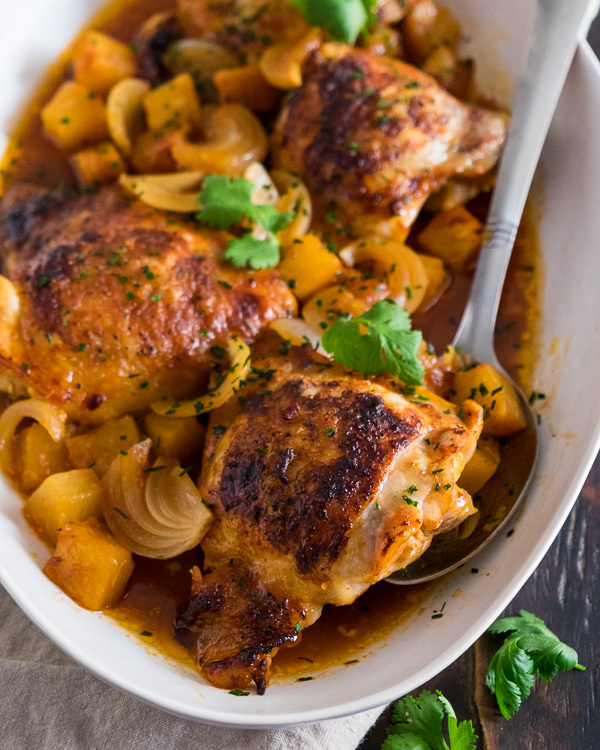 You can wrap the dish with aluminum foil and store it in the fridge and heat up the chicken without a cover at 300 F. Resting the dish will give the chicken more time to absorb flavors from the sauce. The recipe will generate extra sauce so you will end up with enough to serve over a pasta or steamed rice. You could also use a slightly larger baking dish and throw in some bell pepper, to add a crunchy vegetable to your meal. Preheat oven to 450 F convection. Combine pineapple juice, soy sauce, rice vinegar, brown sugar, tomato paste, garlic and ginger in a large baking dish. Stir to mix well. Place onion in into the baking dish and chicken on top without the pieces overlapping. Add pineapple chunks between (not on top of) the chicken pieces. Bake for about 15 minutes and briefly remove the dish to baste the chicken with the sauce. Immediately continue to bake until the skin is crispy and a thermometer inserted near the bone reads 165 F (another 15 minutes). Let rest for 5 to 10 minutes. Serve warm as main. To reheat leftover chicken, bake the chicken with the remaining pan sauce at 350 F until warm. The chicken will stay moist.